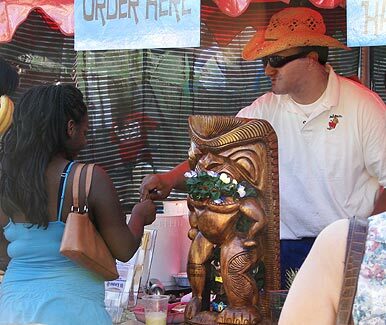 If you happen to be in Arizona this coming weekend, and want to broaden your cultural horizons - for free, at that - you might want to take in the Arizona Aloha Festival March 15 and 16 at Phoenix' Heritage and Science Park, downtown. I found out about the festival last year while shooting photos at the Bikini Lounge; a bar patron told me about it. We won't be able to be in Phoenix at the right time this year, but I did stop in last year for an hour or so on the festival's second day, March 18, 2007. 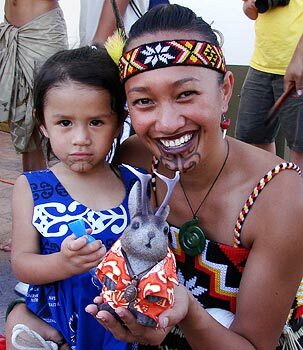 Ace gravitated toward this nice Maori performer, Leilani Miria Thompson-Kihi, shown here with her daughter, who was as curious about about Ace as he was about her people. 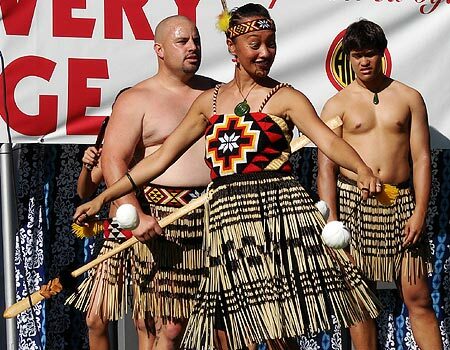 Performances of native dances from Samoa, Tonga, French Polynesia, Hawaii, the Philippines, etc., are the main draw of the festival. 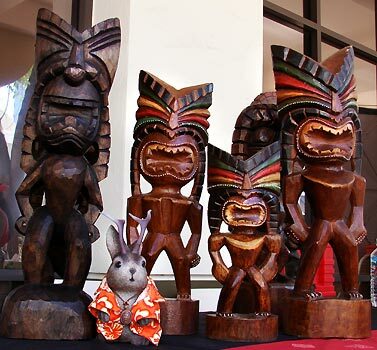 There are also Martial arts performances, storytellers, Tahitian drummers and slack key guitar musicians. 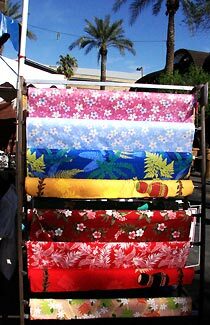 Aside from the substantial Polynesian-transplant population of Phoenix that likes to keep alive their traditions, performers have also come from Hawaii, New Zealand, and the Cook Islands. I wasn't able to stick around after performances and ask names very much last year, but a current festival organizer was kind enough to help me ID a few people. At this "Island Jam", Kamalu Tinnell (red shirt) and Pat Tinnell (white shirt) are playing. If things were on schedule, these were members of the Arizona-based Polynesian Review, Ka’ea Mauna Lani, performing Hula. 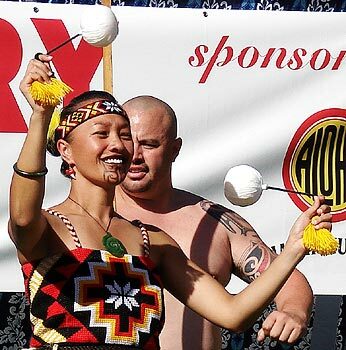 Leilani Miria Thompson-Kihi performed dances with poi balls (those white things). The poi are used as an adjunct to the dance itself, as part of a story-telling tradition. I noticed they weren't on fire, unlike some other poi performances I've seen; I'm someone in charge may have thought fire in a crowded festival wasn't such a great idea. 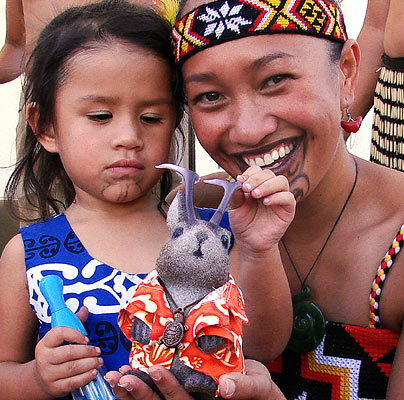 These are other Maori guest artists from New Zealand. Like the women's dances, these also tell stories, often of past battles. 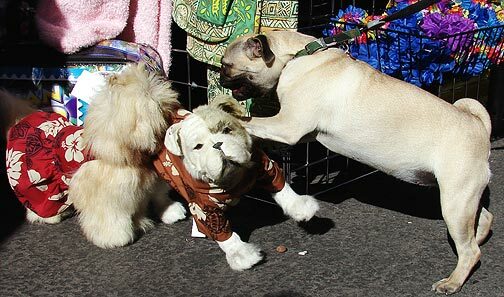 They are also performed for intimidation - a hold-over from more tribal days. 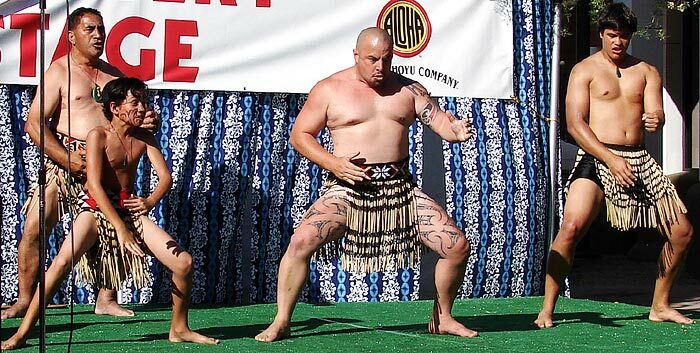 From left (according to festival chair Lacretia Bacon): the older gentleman is David Rawiri Thompson, the young man is Leilani Miria Thompson-Kihi's son, the gentleman with the shaved head and tattoos on his legs is Arapeta Takoko and the youth is from a local Maori family. You're probably wondering about the tattoos. I was. 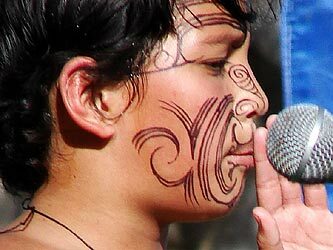 Tattooing is part of a Maori tradition. I don't know whether the ones on this young man's face are permanent or not. 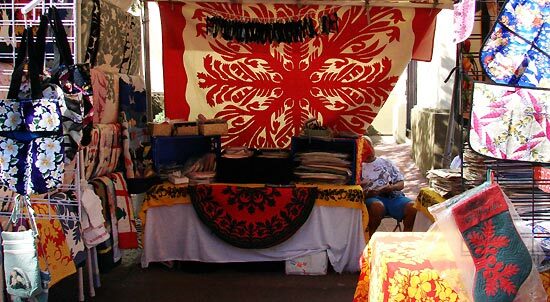 There is of course a market area with Polynesian and island inspired clothing, jewelry, textiles, etc. 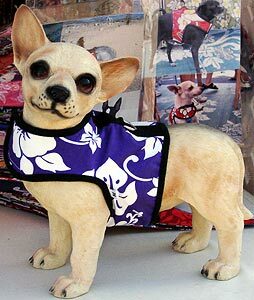 I bought Ace some material for future tiki adventures...not that I know what to do with it, now that I have it. 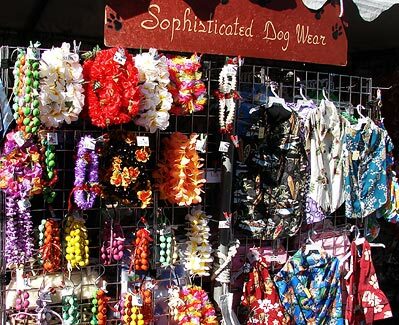 There was even clothing for your canine. 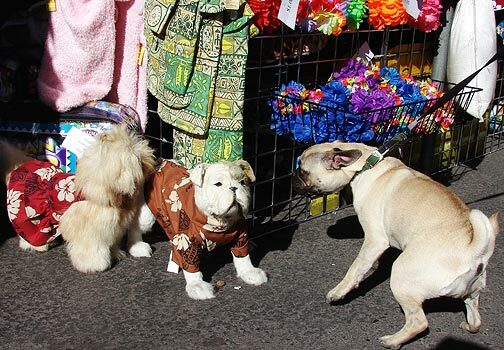 The canine mannequins vexed this real doggie. 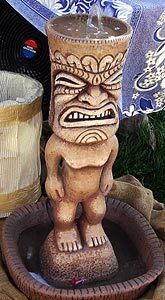 There were no carved tikis for sale at the fair, which was a surprise to me. These were purely for show; someone had brought their collection for display. 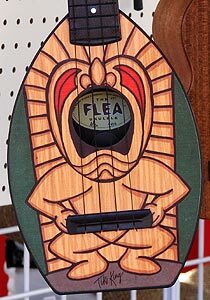 There were a few manufactured tikis hanging around. This one was decor for a food vendor. There was a lot of island-themed food available. I believe that's the case this year as well. 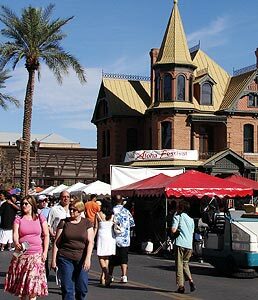 The festival's venue, the Heritage and Science Park, included what is said to be the only preserved block of housing from the original Phoenix town site, including the Rosson House, shown here. Festivities also spill over into the Arizona State University (ASU) campus. 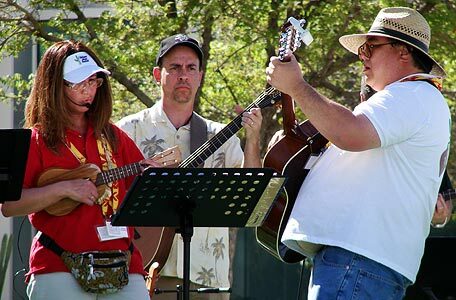 These Ukulele players were hanging out at Aunty Aloha's Ukulele Corner. 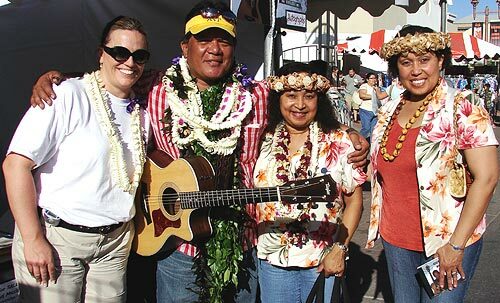 Slack Guitar player Moon Kahele performed and posed with fans. We are looking forward to another great Festival this year. AZ Aloha Festival 2009 has moved to Tempe Town Lake, March 14 & 15, 2009. Thank you for posting the wonderful pictures and we look forward to seeing you again this year.